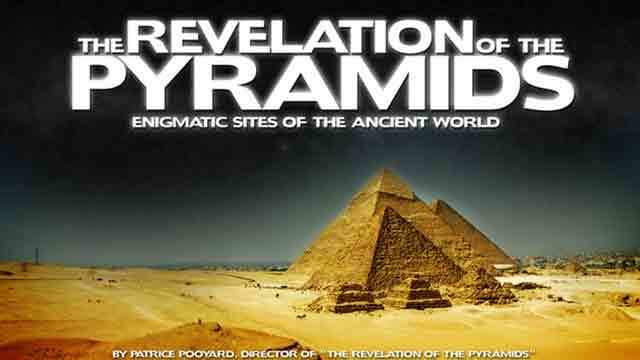 "The Revelation of the Pyramids" (in the original French: La révélation des pyramides) is a 2010 documentary directed by Patrice Pooyard and an accompanying book by Pooyard. The project is a summary of pseudoscientific theories which relate to those proposed by advocates of pseudoarchaeology and ancient astronauts. Through the use of scenic video taken around the world (it is a wonderful travelogue), "The Revelation of the Pyramids" challenges the notion that human development has progressed in a linear form. Instead, human progress is presented as featuring ebbs and flows due to effects outside of human control. I.M. 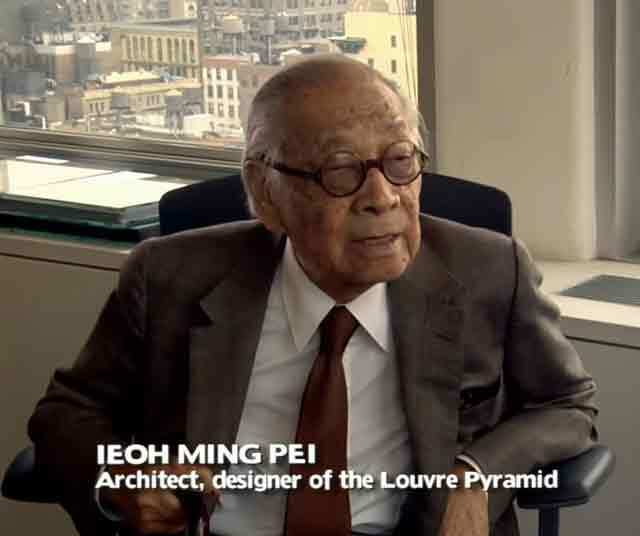 Pei admits that "the proportion of the glass pyramid [that he famously designed for the Louvre] and the proportion of Giza are very close" because the same proportions are "valid today." The sources of this documentary are the unpublished works of screenwriter Jacques Grimault (who disconcertingly is referred to throughout by the narrator as "my informant") about the construction of the Great Pyramid of Giza and other ancient archaeological sites around the world. Grimault's theory is elaborated through an examination of ancient building techniques which supposedly demonstrate precision and commonalities that exceed commonly understood limitations of their times. Both supporting and opposing viewpoints, such as that these similarities are entirely coincidental or accidental, are presented by a variety of credentialed individuals. These include the famed architect I. M. Pei in a brief appearance. The "boggling" three-dimensional symmetry of ancient works, such as this giant statue at Luxor in Egypt, is presented as one form of advanced ancient construction techniques. Grimault's underlying point is that there is an intrinsic cycle of geological change on Earth, including the known movement of the magnetic poles, about which ancient human structures warn. These cyclical changes cause periodic catastrophes, perhaps about every 10,000 or more years. He proposes there was at least one advanced human civilization before ours which was destroyed by such a catastrophe. Pyramids in Egypt and elsewhere, along with other ancient constructions around the globe, were built by such an advanced prehistoric civilization (referred to as "the builders") to convey this warning. This warning also is present in the form of relationships between different structures in widely separated locations including China and South America. 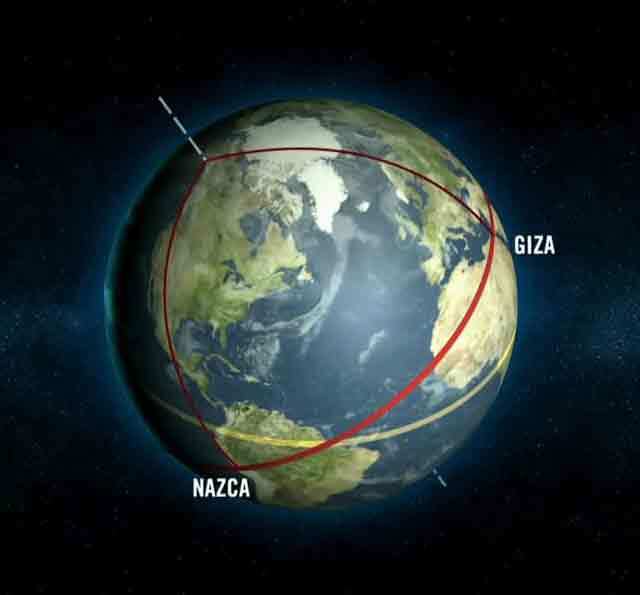 Grimault proposes a 100-km wide band around the earth that encompasses all of the most notorious ancient locations, including Giza and Easter Island. The warnings are most substantially contained (at least within the documentary) by the individual structures themselves, including their dimensions and global placement, along with ancient texts. For example, the builders conceived the Great Pyramid of Giza not as a tomb or monument, but rather to present a mathematical riddle. Among other things, the Great Pyramid is presented as disclosing an understanding of obscure natural phenomena such as the speed of light which should have been outside their ability to measure or decipher. All of these mathematical relationships remain as a warning to earth's current inhabitants who also face destruction. How the builders knew about these catastrophic events before they themselves were destroyed and why they tried to warn future civilizations is left to the viewer's imagination. Grimault views global warming as a forerunner or precursor of another instance of these recurrent catastrophic events. 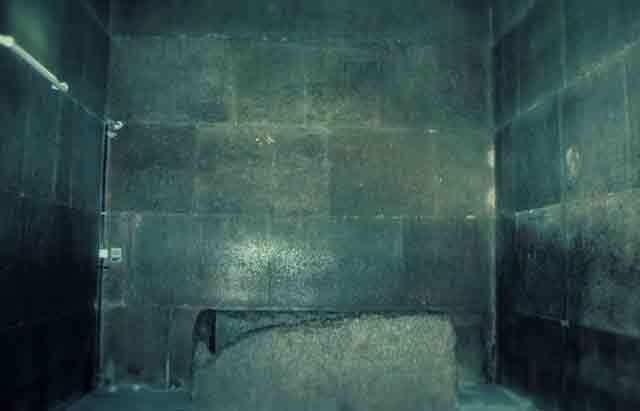 The precision of the Upper Chamber of the Great Pyramid is presented as a "smoking gun" in the ancient-builders hypothesis. "The Revelation of the Pyramids" is a sequence of conclusions (such as that ancient builders knew the value of Pi) to be accepted on faith based on numerical and geometric presentations. 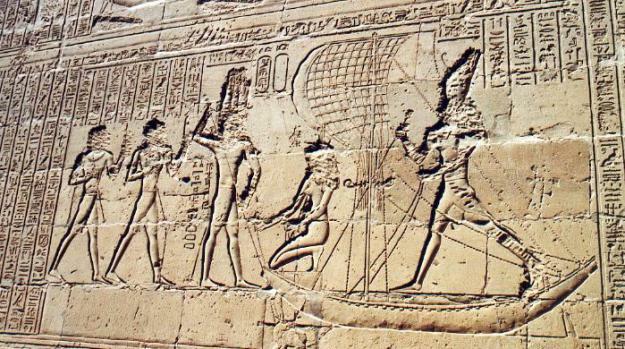 Grimault's sources have been attacked, and much of the evidence presented (such as the appearance in the Egyptian Temple of Seti I at Abydos of so-called helicopter hieroglyphs) are widely disseminated within the "alternative history" genre. The famous hieroglyphics at the temple at Abydos. These have an innocuous explanation for their futuristic aspect, but they still look cool. Some of the conclusions are bizarre, such as that the ancients knew the length of a meter thousands of years before it was first proposed in 18th Century France. Overall, however, "Revelations of the Pyramids" is a brilliant introduction to the field because it incorporates all of the best theories while admitting alternative viewpoints. A typical moment in "Revelations of the Pyramids," when a comparison of circles drawn around the perimeter of the Great Pyramid somehow leads to the speed of light. Anyway, you shall draw your own conclusions, the arguments are there and so are the counter-arguments. The Eye of Africa: Atlantis? So, Is Atlantis Found At Long Last? 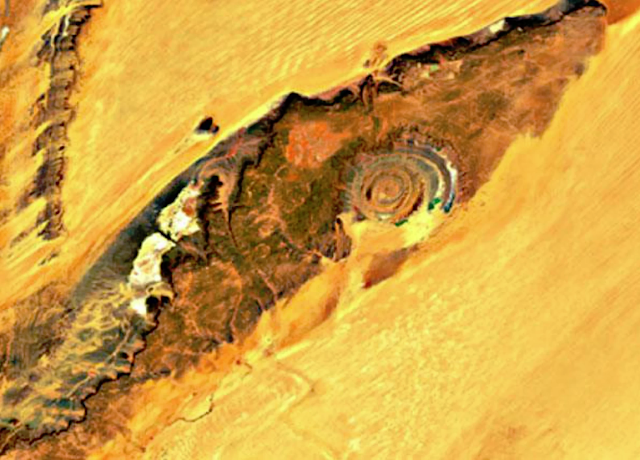 NASA Landsat 7 image of the Richat Structure, with north at the top and south at the bottom. What I propose in this article is nothing less than the possible location of Atlantis. The real Atlantis. The one where the name came from, not the casino or the hotel or anything else named after Atlantis. Yes, that Atlantis. The location discussed below is quite likely is one you've never considered before. However, it "works." I am going to assume that you have some familiarity with Plato because this article would become a book if I were to recite all of Plato's references with links. Just accept that what is said below about Atlantis does come straight from Plato and nowhere else unless otherwise noted. To verify, read Plato yourself if you are suspicious, better you do that than retain lingering suspicions about my references to Plato here, suspecting that I am "being selective" or using a biased translation or whatever. All I will claim in this article is that I will convey what Plato himself wrote about Atlantis, with no embellishment or distortion or exaggeration, for purposes of matching those characteristics with a very specific place that exists today. I compare Plato's points about Atlantis to this specific place so that you may independently learn about that place and decide for yourself whether his account matches that location. Atlantis: What's the Big Deal? Atlantis is only known in detail from the writings of Plato, who claimed to obtain his information from the writings of his ancestor Solon (six generations ahead of Plato). Whatever Solon wrote was "kept in the family" and ultimately came to Plato's attention. Apparently, Plato's source from Solon was in form of writings that now are lost. 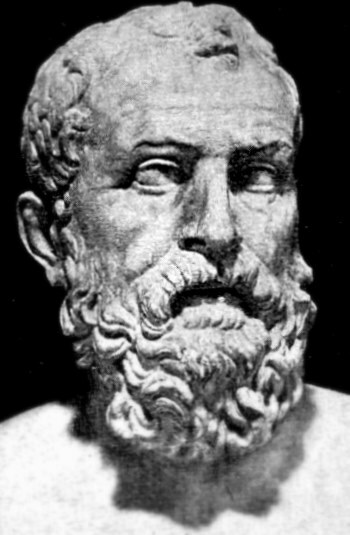 Solon, Plato claims, obtained his information from the high Egyptian priests of Sais in 600 B.C. The unknown priest translated some hieroglyphics for Solon in the temple. That temple in the Nile Delta was well known at the time but since has ceased to exist. The destruction of Atlantis occurred 9,000 years before that time, the priest said, so that makes it roughly 11,300 ago as we would reckon time. The temple was not hidden, and anyone at the time could visit, given the means. Thus, Plato's account was not some kind of hocus-pocus kind of deal, it was based on a verifiable source. The temple inscriptions were verifiable for anyone who had Solon's or Plato's accounts and cared to double-check them. In those far-away days that Ocean could be navigated, as there was an island outside the channel which your countrymen tell me you call the 'pillars of Heracles'. 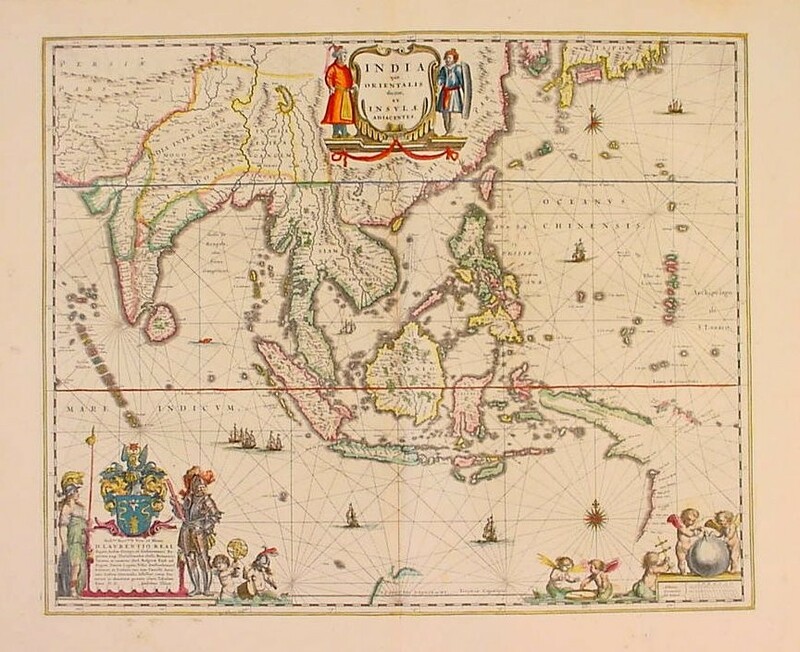 This island was larger than Libya and Asia together, and from it seafarers, in those times, could make their way to the others, and thence to the whole opposite continent, which encircles the true outer Ocean. Fortunately, Plato is very specific about Atlantis itself after that very open-ended geography: it is formed by concentric islands of a certain distance from the city center, there are mountains to the north with rivers flowing through them, and so forth. To summarize, Plato said Atlantis was out in in the Atlantic (or beyond) somewhere - or at least entering the Atlantis was how you got there (which may seem like a fine point, but really is the crux of the case I'm about to make). Since the ancient Greeks didn't know anything at all about the Atlantic beyond the fact that it was there, Plato's description of the location isn't exactly helpful to us today. 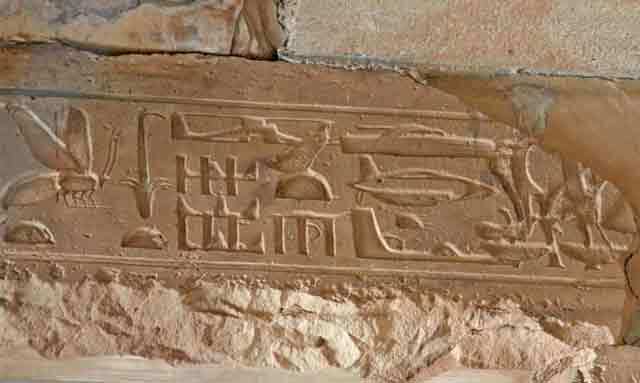 Engravings at the Temple of Horus at Edfu appear to corroborate Plato. 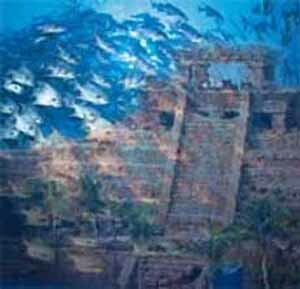 Contrary to popular belief, Plato is not the only ancient source of knowledge about Atlantis. For example, the inscriptions of the Temple of Horus at Edfu (inscribed after Plato during the Ptolemaic period between 237 and 57 BC) appear to corroborate Solon and Plato without actually using the word "Atlantis" and apparently deriving from other sources. There are other ancient sources about Atlantis of declining levels of acceptance by mainstream scholars. 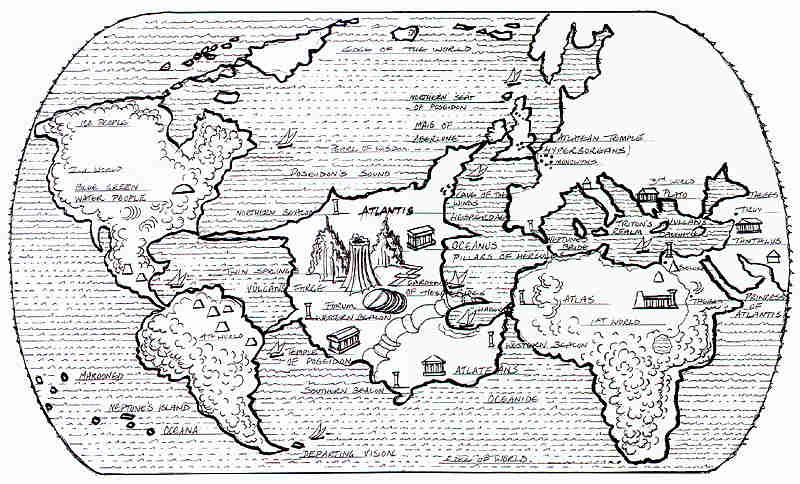 Herodotus of Halicarnassus, for instance, placed Atlantis on his map of the world south of the Pillars of Hercules. He did this after visiting the Temple of Neith at the city of Sais, the same place that Plato visited. However, Herodotus visited the temple in 450 B.C., fifty years before Plato. 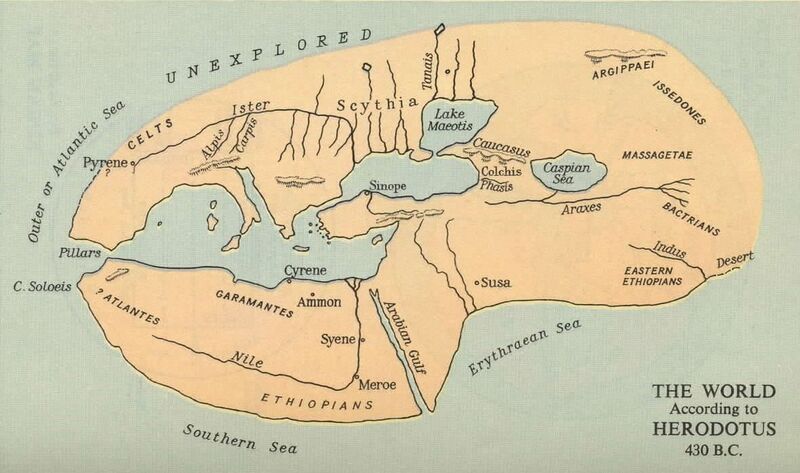 Reconstruction of the map of Herodotus, dated to roughly 430 B.C. - several years before Plato was born. There are also ancient sources that appear to corroborate parts of Plato's Atlantis account without actually being about Atlantis (such as Plato's claim about ten initial Atlantean emperors which matches independent Egyptian history about the ten Auritean rulers, called Aleteans by the Phoenicians). However, Plato is considered the Gold Standard as far as Atlantis is concerned, and nobody has any doubt about what he said and that he was describing Atlantis. As far as Atlantis is concerned, what Plato says, goes. To avoid distractions and debates about meanings and legitimacy, Plato's writings are what we will rely upon - but just bear in mind that other sources corroborate what Plato says. Is this mysterious blob Atlantis? So, based on Plato's very specific but also frustratingly vague description of the location of Atlantis, people have been searching for Atlantis for centuries. Why exactly everyone wants to find Atlantis is a bit unclear at times, but Atlantis has acquired a legendary mystique. Fantastic tales of death rays and advanced power sources have been joined on to the legend over time despite there being no indication whatsoever from our only source, Plato, that they ever existed. Because of this mystique, Atlantis is the true Holy Grail of adventurers - anyone that finds Atlantis and can prove it basically will become immortal within the scientific community. That is what happened when Heinrich Schliemann - a rich German dilettante determined to find ancient Troy - actually did discover it (to everyone's utter amazement). The lost city of Angkor in Cambodia, capital of the Khmer Empire, is similar, a fabled city not rediscovered until the 1860s. The same blob a little further out and colorized. 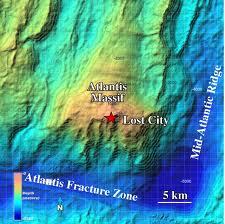 As a result, various theories as to the location of Atlantis have been proposed. However, as exciting as they seem at first, every single candidate ultimately collapses for one reason or another. For instance, several islands within the Mediterranean have been proposed. Since every island there contains ancient ruins, it is possible to point to those ruins as "proof" of Atlantis. However, the one thing that Plato was clear about in his dialogues was that Atlantis was not in the Mediterranean, and in fact was beyond what we now know as Gibraltar. The Greeks knew all about the Mediterranean islands and Plato would have just pointed to one if that was the location of Atlantis. So, enticing as those Mediterranean islands and their ruins may be, they are not Atlantis. Sorry. The possible location of Atlantis. You can still see the blob if you look hard. (Credit: ESA). However, you might be surprised to learn that there is a location that meets virtually all of Plato's requirements. It is in the right location, it is the right size, it has the right geographical features, and it makes absolute sense. You've never heard of such a place? Well, that's why you should keep reading! You may be looking right at Atlantis and not even realize it. (Credit: ESA). Let me preface this by saying that I am not trying to prove here that the location in question is Atlantis. It may or may not be, and it has not been proven as such. The point is that this one particular place meets Plato's specifications and actually could be Atlantis. That's a lot different than that it is Atlantis. 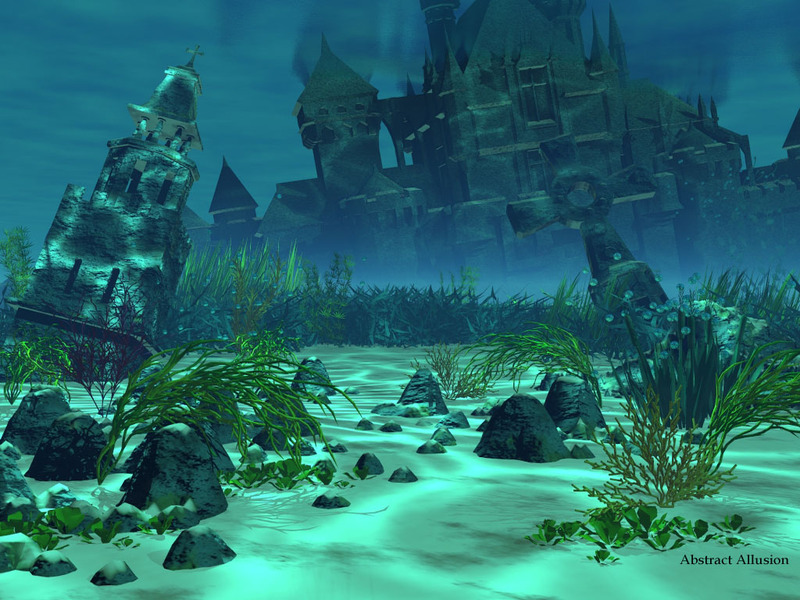 We'll look at the pros and cons as to why this mysterious spot might or might not be Atlantis. In my view, the arguments why this is Atlantis outweigh those that say it is not Atlantis. However, that is for you to judge. 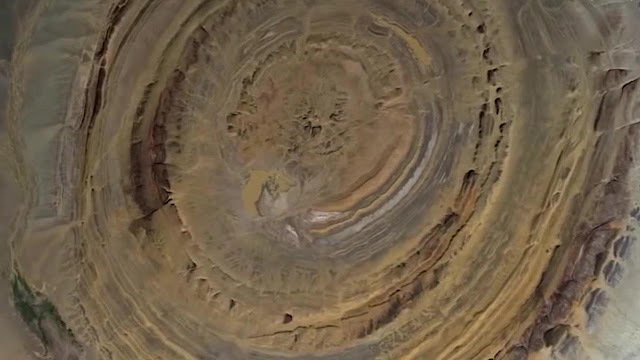 A close-up of the Richat structure shows the concentric rings. Note what appears to be an ancient channel flowing to the southwest toward the Atlantic. (Credit: ESA). What is the Eye of Africa? 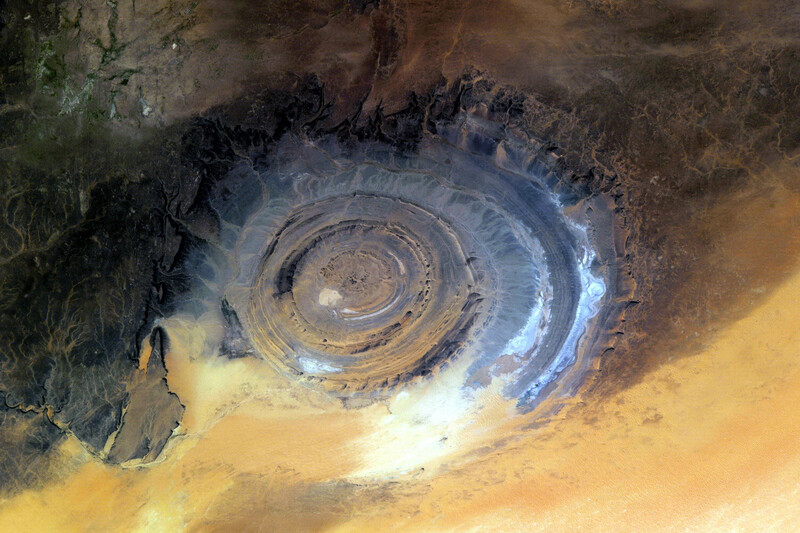 Its scientific name is the Richat Structure. It is located in Africa in the country we now know as Mauritania. 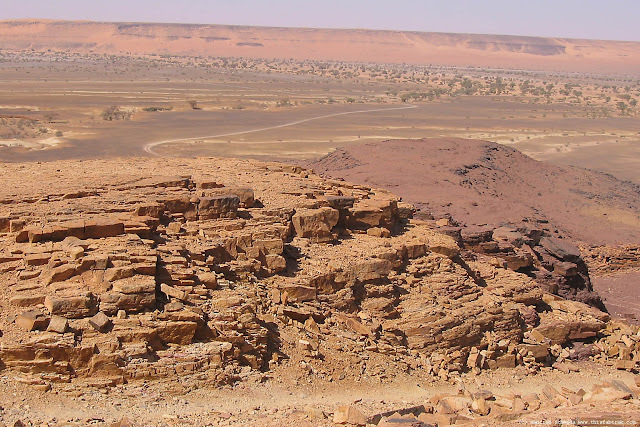 The Eye of Africa is in the province of Adrar, which only has about 70,000 inhabitants. 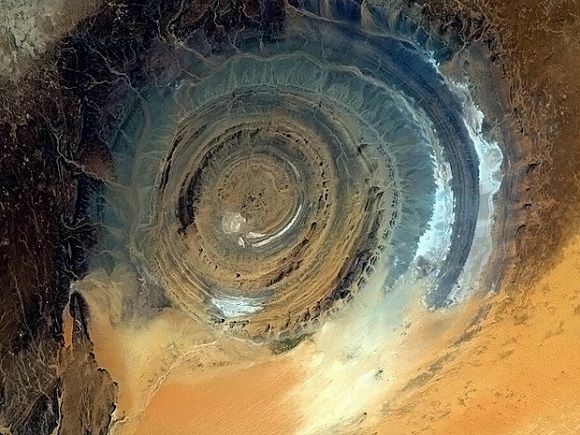 The Richat Structure is a geologic formation (a "phi structure") that is generally accepted to be formed naturally. Phi structures are closely associated with valuable nearby mineral deposits. Technically, the Richat Structure is an eroded circular anticline (structural dome) of layered sedimentary rocks (this is according to NASA). 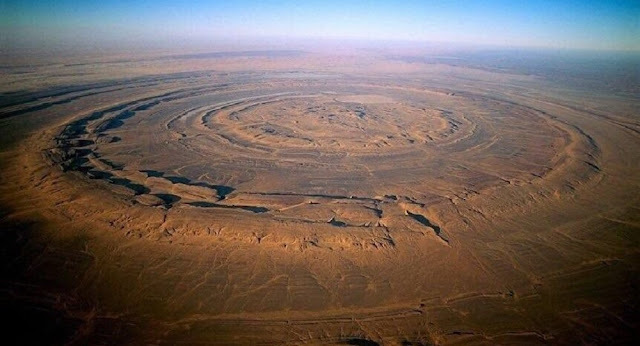 However, there is some disagreement about how the Richat Structure was formed, with some contending that it is the result of an asteroid strike, known to create phi structures. If the Richat Structure was inhabited at any point, the inhabitants simply availed themselves of what nature had provided, so how it was formed really is irrelevant for our analysis. 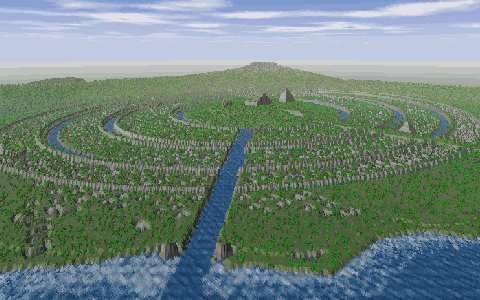 Plato doesn't specify that land on which Atlantis sat was shaped by humans. Formed during the Late Proterozoic Era according to the most accepted geologic theories, the Richat Structure would have been available to anyone to use. The Richat Structure is a harsh landscape indeed - which has kept explorers away. 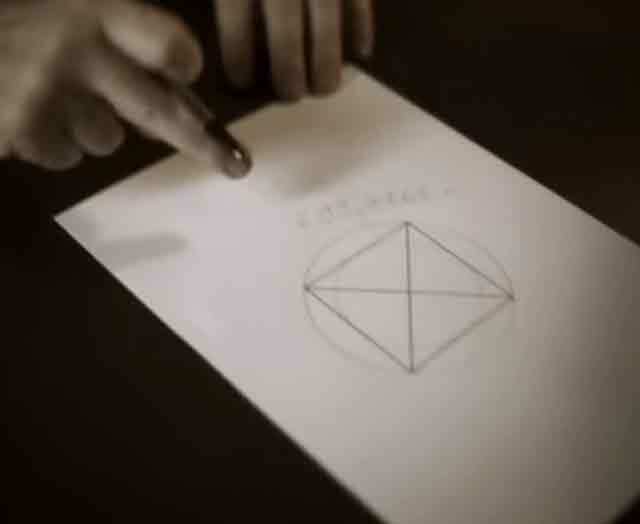 It is shaped in the form of concentric circles. The date provided by Plato for Atlantis' destruction, 11600 years ago, coincides with a post-glacier change in sea levels known as the Younger Dryas. Since the Eye of Africa and Egypt are not that distant, it makes perfect sense that Egypt may have been a colony of Atlantis as claimed by Plato if it was located there. The key symbol of ancient Egypt, the Eye of Horus, bears an uncanny resemblance to the Eye of Africa (see picture below). The first ruler of Mauretania is known as Atlas (where the mountain range gets its name) - which just so happens to be the name of the first ruler of Atlantis. What a coincidence! Ancient historian Herodotus placed a nation called Atlantis in exactly the location of the Richat Structure in a map that he drew up 2500 years ago. 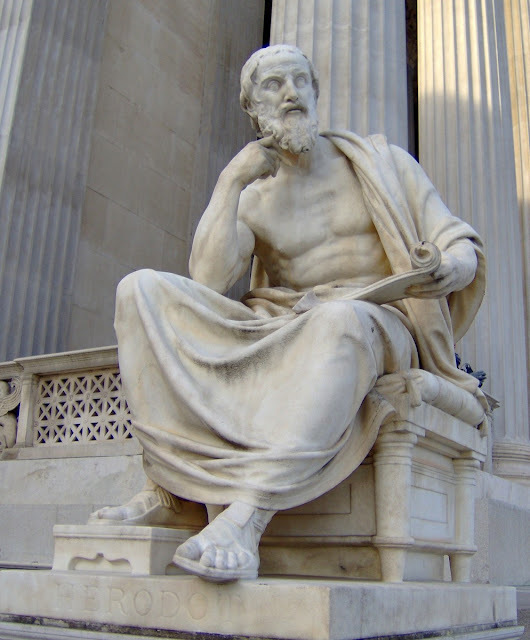 Herodotus, incidentally, is known as the "Father of History" and was born 58 years before Plato. The map is dated to 430 B.C., three years before Plato was even born. Herodotus died before Plato was born. Herodotus posed a different possible water route to Atlantis, the Nile, which he suggests ran from the Sahara in the past and which is certainly possible. 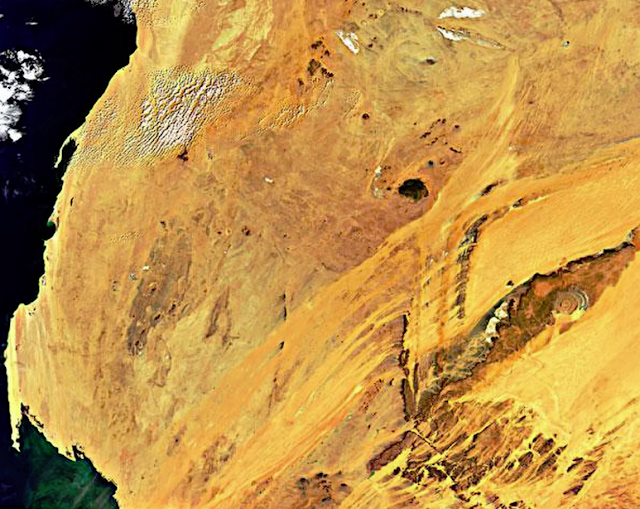 There is ample evidence that the Sahara was under water at some point in the distant past. These are all details specifically pointed out by Plato (again, read Plato to verify this). 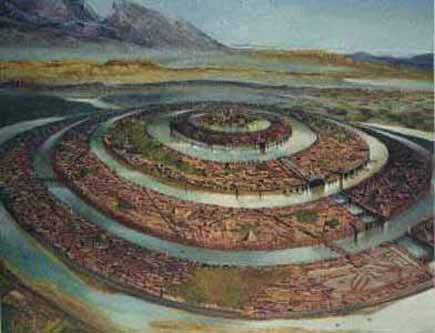 Just as one example, Plato said that Atlantis was 127 Stadia in diameter. At 607 feet per Stadium and converting a couple of times, this gives a diameter of about 23.5 km (the exact length of a Stadium is actually unknown, but that is the most accepted length). This, as noted above, is the diameter of a key structure within the Eye of Africa. Edgar Cayce, a famous "seer" and healer of the early 20th Century, famously predicted that Atlantis would be "discovered" in 1968. It was his more famous, and controversial, prediction. Some other things happened in the mid-1960s that have been claimed as the supposed fulfillment of this "prediction," and then used to damage Cayce's reputation because these discoveries (such as off Bimini) now are considered not to be Atlantis (though, who knows, maybe they are remnants). 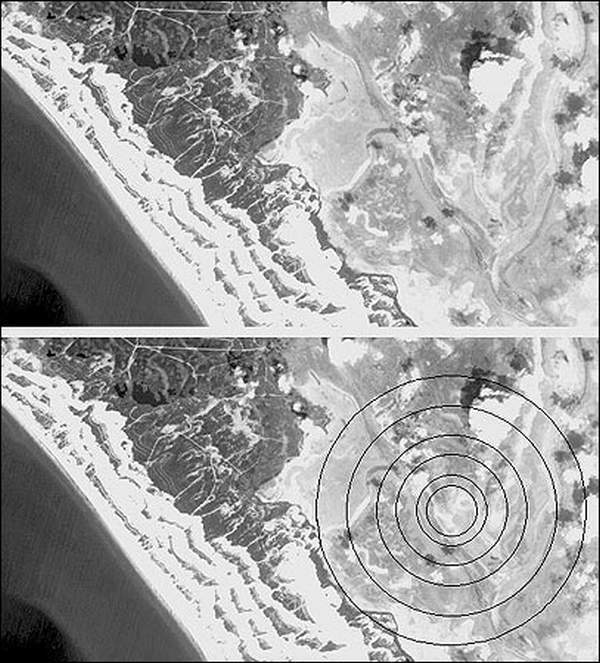 However, note that the first photographs from space were taken of the Eye of Africa in 1965, and nobody on the ground could possibly see the structure as fulfilling Plato's account due to its magnitude. Perhaps nobody put the Eye of Africa photographs together with Atlantis until 1968 when they had a "Eureka!" moment and spotted the similarities. 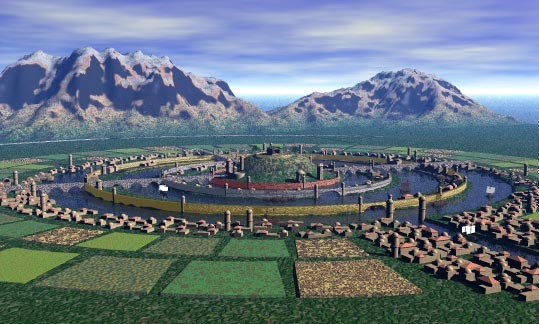 An artist's conception of Atlantis based upon a strict reading of Plato. 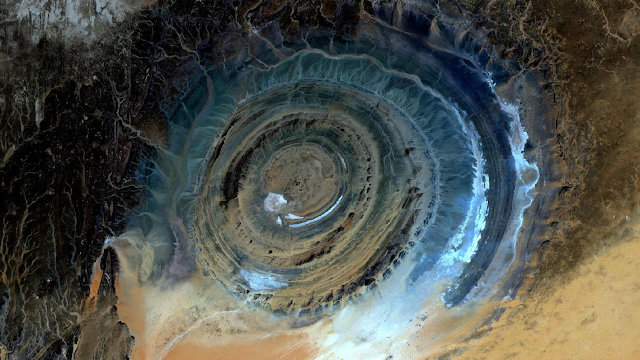 This is not based upon the Richat Structure - but notice the astonishing similarities with the photos of the Eye of Africa above and below. In any event, Cayce was adamant that he wasn't good with dates in his predictions. You have to admit - getting within three years is pretty close. As mentioned, for all we know, Cayce actually was spot on and 1968 was the year. If the Richat Structure finally is determined to be Atlantis, that would have to be seen as complete vindication for Edgar Cayce. I realize that even mentioning Cayce will turn some people off as venturing into the realm of pseudo-science, so ignore this amazing coincidence if it distracts you, as I am trying to lead you to Atlantis, not rehabilitate Cayce. It is simply astounding that this one location encompasses all of these very specific details given by Plato. There's no other way to put it. Okay, Why Haven't I Ever Heard Of This "Eye of Africa" As Being Atlantis Then? It's all Pseudo-Science! You're Just Fantasizing About Aliens! You're a Crackpot! Look, I get it. You start talking about Atlantis and you also must believe in Martians and UFOs. It's easy to read these kinds of articles with a grin and a smirk, secure in the belief that it's all just comic-book stuff. We all understand the fantasy of people wishing there was "something more" than just dull reality, that the aliens would just arrive already and "beam us up" so we can go traipsing around the Cosmos together as interstellar brothers. Lucas Thanos ~ Dіstаnt Раnоrаmа from Lucas Thanos on Vimeo. Well, let's stick to facts. Atlantis is not "pseudo-science" as some "respected sources" would have it. This has nothing to do with "aliens." There is solid historical support for a place called Atlantis that was the center of some sort of society. We know as much about Atlantis as we do about much of ancient history which depend upon only one or two secondhand sources. Historians often must rely on a single source for events covering large swathes of time, with only sketchy corroboration. There may have been additional written sources for Atlantis available in Plato's time, and in fact there almost certainly were, because Plato says that he used one himself without considering that exceptional. Herodotus had a source for Atlantis, too, and it wasn't Plato because Herodotus was dead before Plato was born. 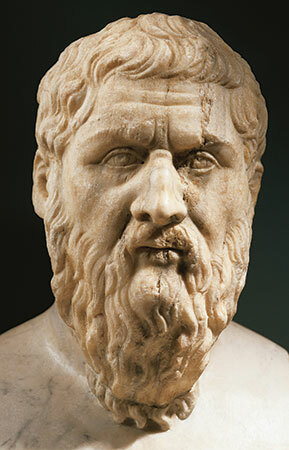 Plato did not rely upon Herodotus, so there are two independent lines sources, not one. And, considering the temple inscriptions which strongly suggest an account of Atlantis without actually naming it, possibly more lines of sources. Herodotus is the smoking gun in the Atlantis debate that the detractors overlook. Plato and Herodotus are two of the most revered figures of ancient history and their writings are precise and their reasoning is logical. There is no reason to doubt them any more than any other revered historian such as Strabo or hieroglyphics on Egyptian temples. What they offer is proof of an Atlantis, and they corroborate each other. 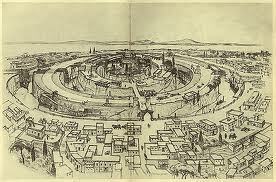 A typical artist's conception of Atlantis, based, of course, on Plato's writings. While some think that Plato may have "made the whole thing up" for rhetorical purposes, there is no evidence to support that. It is just a way to explain away the inability of explorers to find Atlantis. If Atlantis was entirely a work of fiction, why did Plato give such precise details about it that did not advance the purposes for which he recited the story? There would have been no need to give its precise dimensions, for instance. Unfortunately, the particular source that Plato claims to have used and perhaps many others have been lost over time due to floods or deliberate mischief such as the burning of the Library of Alexandria. Supposing that other detailed sources referring to Atlantis are still in existence somewhere, they have not been found. However, there are lots of possible locations for those sources - ancient Pompeii, for instance, is only partially excavated and wealthy Romans were known to maintain impressive libraries. Who knows what may have been buried there or elsewhere? One of the reasons that the Richat Structure has never been associated with Atlantis is that its unique shape is only visible from space. Astronauts first noticed its peculiar formation in 1965, but they weren't looking for Atlantis and dismissed it as a curiosity. Thus, if the argument is that this would have been figured out hundreds of years ago if it were true, that won't wash. Nobody had any inkling that Atlantis might be in such an unlikely spot until very recently. Another reason for the obscurity of the Eye of Africa is that it is remote. Located in a remote area of the Sahara, it is accessible only by a dusty gravel road and very few people go to the Eye of Africa. There's not much reason to go there, either as those that do visit can't see any difference from the rest of the desert from ground level. It is a hostile environment that travelers only want to cross, not stay and "investigate." The Richat Structure is very, very different, as seen from space, but just more desert when traveling on the ground or in an airplane. 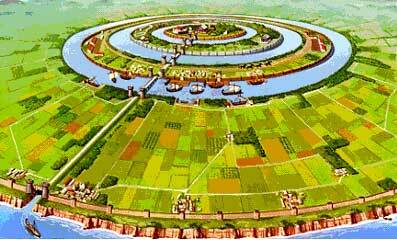 A third reason that the Richat Structure is not associated with Atlantis is that there are no known ruins there. Well, that is overstating it - there are artifacts, but they are not what we usually associate with Atlantis. There are African relics. You would expect something like death ray machines and so forth because of the fanciful imaginations of some people in Hollywood - but there isn't anything remotely like that. At least, nothing has been found, but Western Sahara is one of the most unexplored regions in the world. Nobody has dug there. Whatever was there, if anything, might still be there, but buried under sand or rock. Or, it may have been washed away in whatever cataclysm destroyed it in one night - as mentioned again by Plato. Flash floods can wash away just about everything. Mauritania also is a dangerous place with travel advisories in place. 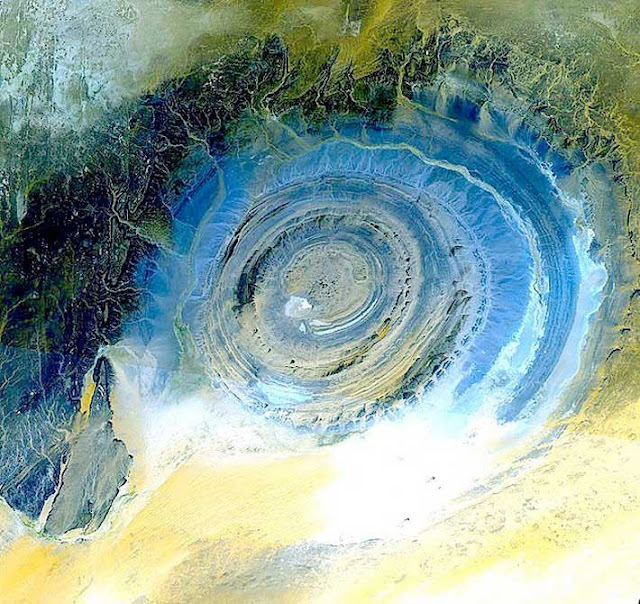 So, few experts go to the Richat Structure, let alone dig there. But here's a shocker: satellite images suggest that there may - may - be buried structures in the Richat Structure. There are rectangular shadows which in other places have suggested buildings. I'm not claiming this as proof of anything. Nobody will know what is underground in the Richat Structure without some digging by professionals, and that would be expensive and difficult. Oh, and as to whether I'm a crackpot, you can be the judge of that. So Why Isn't This Atlantis Then? Why Are You Quibbling? The Eye of Africa historically has not been associated with Atlantis because everyone assumes that Atlantis is at the bottom of the ocean. 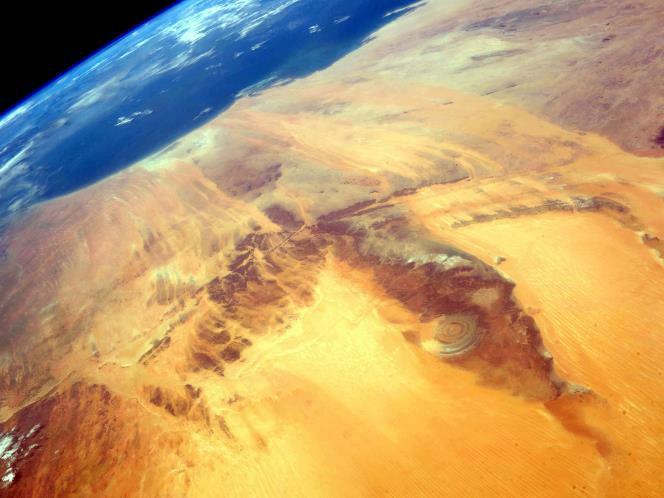 This brings us to the one great reason why the Richat Structure usually is not considered in the hunt for Atlantis: it's not only completely above water level, it is well above sea level. The image was created from various bands based on Sentinel 2A data of the EU Copernicus program and provides a spatial resolution of ten meters. The image has been digitally altered to compensate for atmospheric factors. Well then, that completely rules the Eye of Africa out as being Atlantis - right? Because Plato says it sank into the sea! Well, maybe, but probably not. Western Sahara certainly isn't "muddy" as described by Plato now, but it could have been once. It is possible that the Atlantic did reach as far as the Richat Structure at some point in the distant past. The sands of the Sahara are known to originate from the Atlantic, and it may have been those sands blowing east that turned the water access to Atlantis "muddy" (a very peculiar description for Plato to use for an ocean region). Those blowing sands would have fouled the water access and ultimately made the area inaccessible by sea. The fact that nearby water wells up to 200 feet below the surface contain seawater to this day suggests that in fact the area was connected to the sea at some point. It is widely accepted that the climate of the Sahara was radically different a few thousand years ago, with lakes and vegetation. Atlantis may have been a casualty of climate change - no, not man-made climate change, but natural climate change that always takes place on planet Earth. 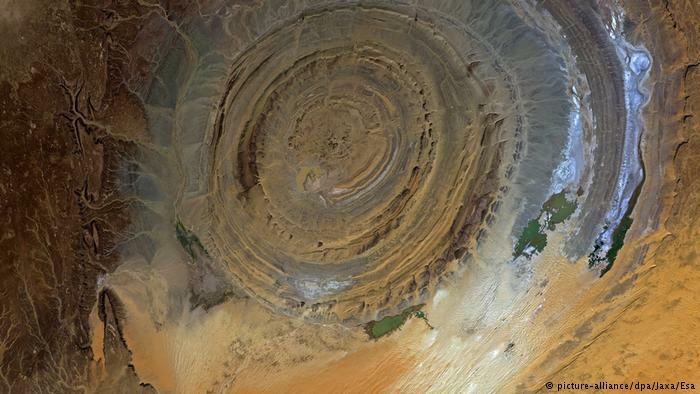 View of the Richat Structure from Google Earth. Its coordinates are (21°07'30" N, 011°24'00" W.
Various geologic theories can be spun to explain why Atlantis might be above sea level now when in the past it wasn't. A change of 1300 feet in 12,000 years is hardly impossible, and, in fact, is known to have occurred in places like Antarctica and the Rockies. These theories include tectonic plates pushing land up from underneath, subsurface magma chambers expanding, and that sort of thing. In fact, the very design of the Richat Structure suggests that it was formed by the expansion and contraction of the surface. It is generally accepted that many lands that are are familiar to us once were underwater or were connected to the sea when today that would seem ludicrous. 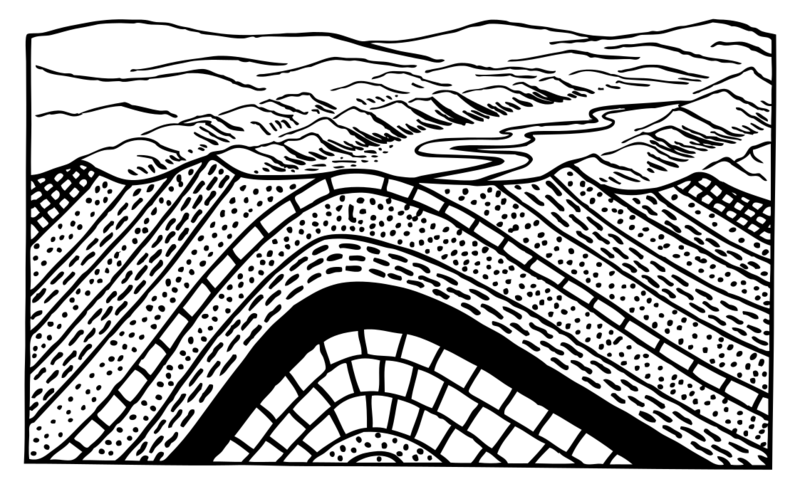 The area of the Rocky Mountains, for instance, was once at the bottom of a large inland ocean. The Richat Structure looks like nothing special on the ground. It is only from pictures taken from orbit that you can appreciate its possible significance (Photo courtesy of Hudson Valley Geologist). Things change over time, and geology as a science has theories but no proof as to what causes specific areas of land to uplift (there are multiple theories about the formation of the Rockies, for instance). 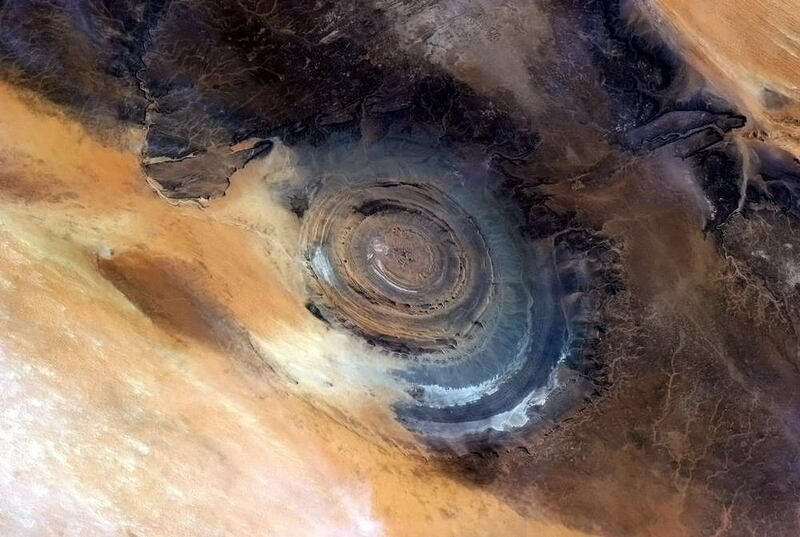 In fact, a leading theory on the Richat Structure is that it is a deeply eroded geologic "dome" that arose from the elevation of different strata of the earth. So, not only is an uplift, or anticline, possible, it appears to be at least one possible explanation for the Richat Structure's current elevation of 1300 feet above sea level. A generic diagram of an anticline taken from Wikipedia. I'm not claiming a theory as my own here - I am saying that there are theories by respected geologists that would explain Atlantis now being above sea level. It's up to the experts to reach their own conclusions, all I'm claiming that it is physically possible. Professional geologists have to be very careful about seeming to "verify" Atlantis - well, at least until they get tenure. So, we will need insurmountable and conclusive evidence before any will announce that the Richat Structure could have been at sea level. That is unlikely to happen any time soon. So, while it may seem "obvious" that a structure in the desert and hundreds of feet above sea level cannot be Atlantis, the associated science cannot rule it out. And that would be the perfect hiding place for it, the reason it has never been discovered or at least recognized as Atlantis. 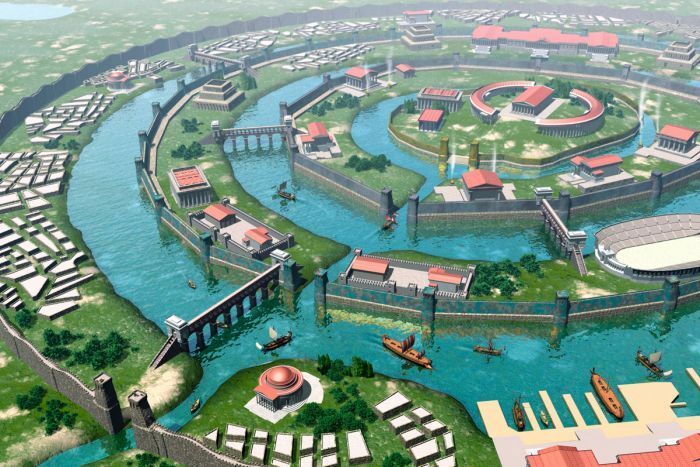 The Eye of Africa meets virtually all of Plato's very specific requirements for Atlantis. In fact, the Eye of Africa meets them better than any other known place on earth, without exception. If you read Plato, and compare his description of Atlantis to the Richat Structure and add a little imagination about it being at sea level and populated, it is almost uncanny how closely the two match - it's an absolutely dead-on description of it. Really, I don't see how he could have given a better description of the Eye of Africa with the above provisions, and people of ancient times could only have known the part about the concentric rings if there had been water there to distinguish them (they are not discernible otherwise at ground level). 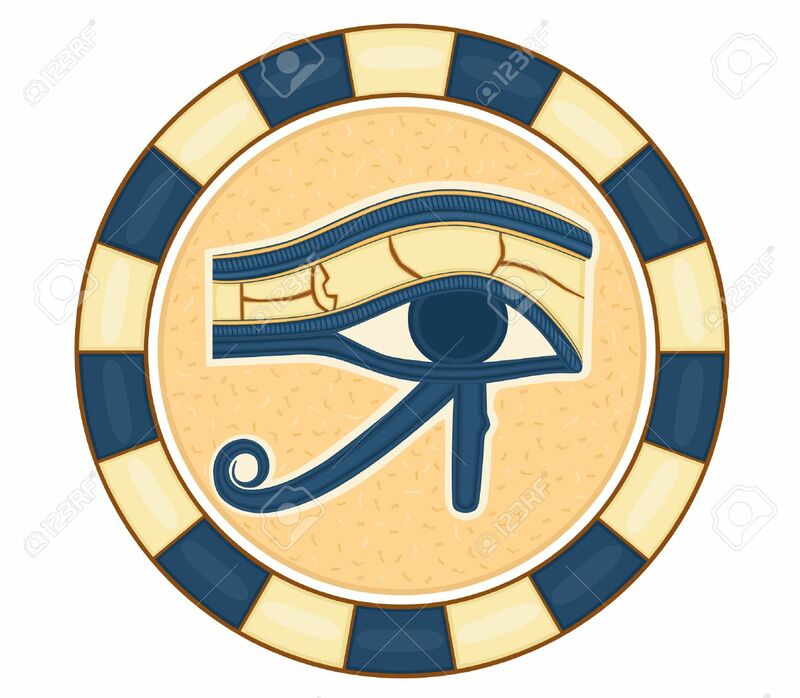 It does not take an overwhelming amount of imagination to see the figure of Atlantis in the shape of the Ancient Egyptian Eye of Horus. 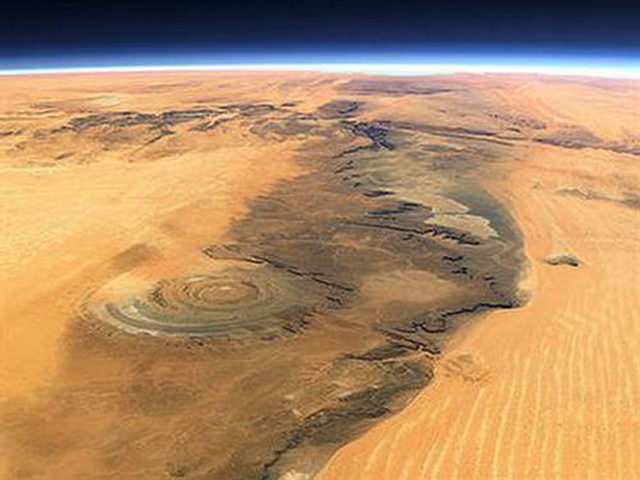 Think of how the Richat Structure looks, with the mountain range to the north and the direction of its "outlet" to the sea. Then, look at how that stylized eye with the heavy eyebrow and tear extending down to the left. Draw your own conclusion. 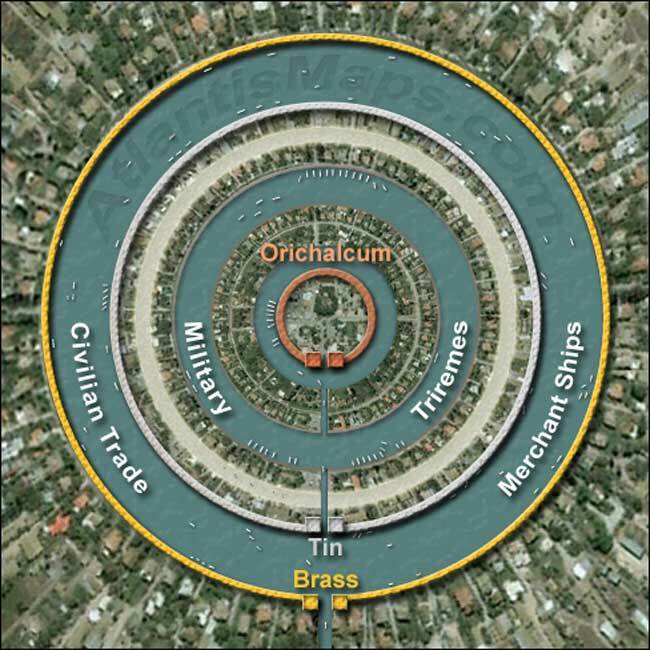 The few reasons why the Richat Structure does not match the description of Atlantis could be explainable - I am not saying that they are adequately explained given current knowledge, I am saying they could be explainable given additional quite reasonable but unknown factors of geology and archaeology. The differences absolutely do not exclude the site from being Atlantis. 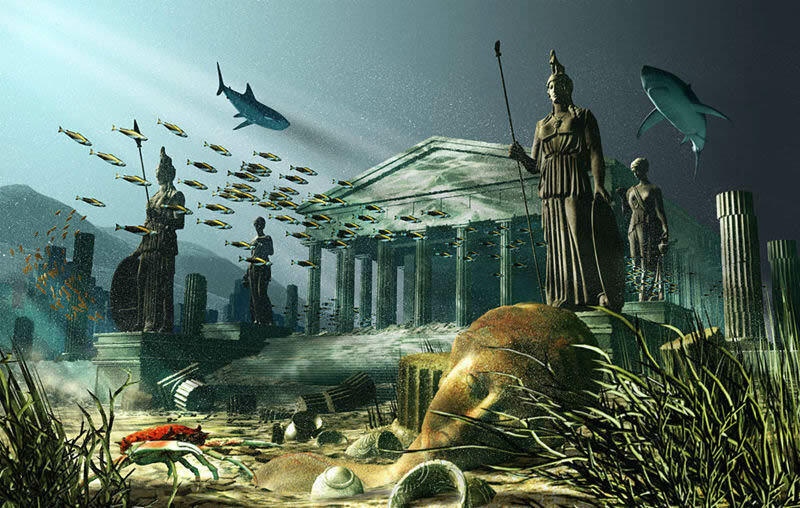 Plato himself said that the tale of Atlantis was "strange." This is an area worthy of further research. View of the Eye of Africa from the International Space Station. Note the rings, the mountains with what appear to be dry river beds to the north, the outlet to the southwest toward the Atlantic, the central circular location for the town. Maybe it isn't Atlantis, but it is an uncanny match to Plato's description. Anyone who has been following my saga of getting "Avram, Thief of Catland" out the door for people to read may understand that I'm happier that it is done than that I was able to do it, if that makes sense. It's a fun read, historical adventure with a number of twists and characters with issues. It is available for download here, where you can learn more about the characters and plot. I've sold some copies, a goal I've always had. Everything else is gravy, this was never a money-making scheme. "Avram, Thief of Catland" was one of those projects that you sometimes just have to do, regardless of the outcome. If you do read it - let me know what you think. 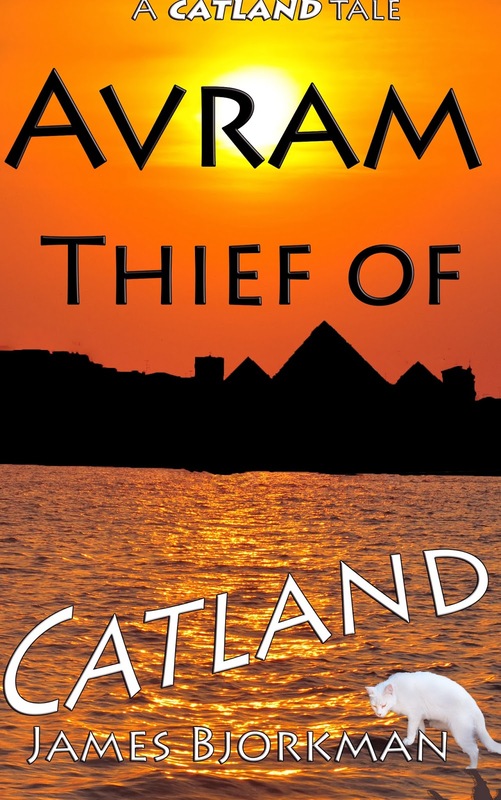 Join us for a wild ride in this historical fiction of Egypt during the age of the Pharaohs! Avram is a young thief, the best of his generation. 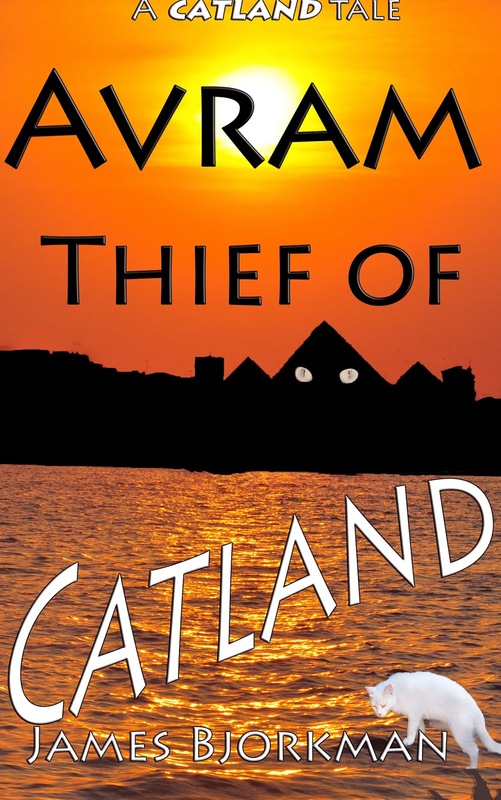 With no time for friendship or normal teenage pursuits, Avram has set his sights on the greatest prize in the City - the sacred, closely guarded treasure of shadowy ruler Absidian. The heavily guarded temple is patrolled at all hours by the dreaded katkas, fierce beasts who devour their enemies whole. For Avram, though, it is but a simple exercise in surprise and stealth - until things go horribly wrong. 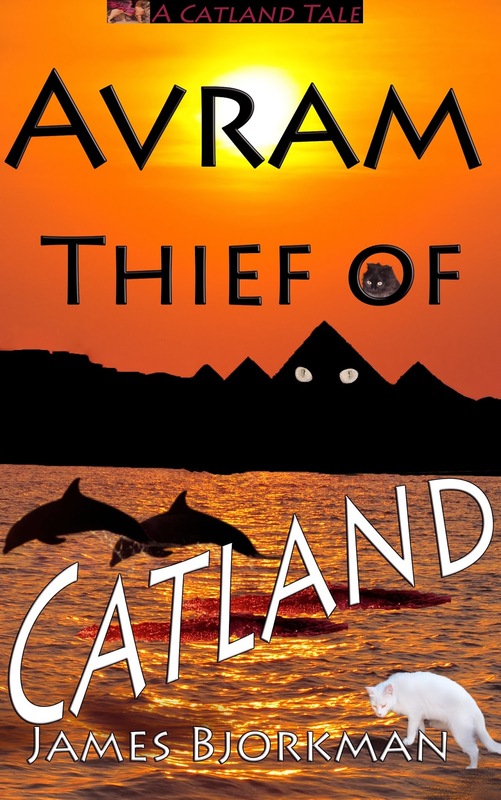 Stealing the treasure is one thing, but Avram soon learns that escaping it is quite another. He is stunned to find that his prize is not gold or jewels, but merely a drink within an ornate, strangely shaped bottle. With nothing left to lose, he imbibes - and strange things start happening, things that he could not foresee, and which dramatically alter his physical form... forever. 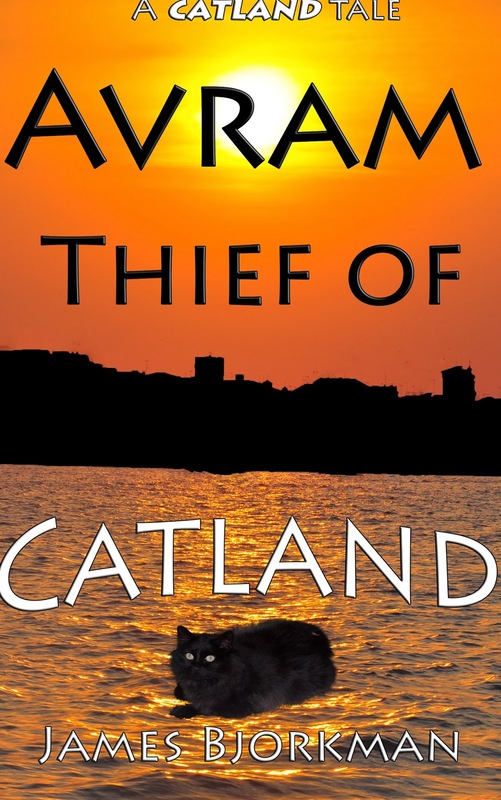 Pursued by the evil Abidian and her herd of snarling katkas, Avram has only two options: flee, or perish. Escaping on a passing ship, he leaves his home behind, heading into the unknown barbarian world. 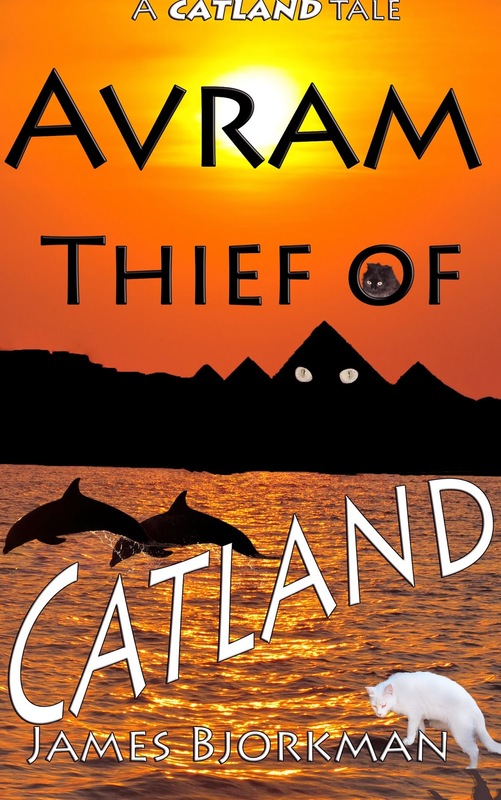 Avram now is ageless and timeless, condemned to spend eternity on the run until he can find a way to defeat Absidian and reverse the effects of the potion. In this first volume of a planned multi-part series, we view the ancient world from a unique perspective, that of a man who befriends the powers of ancient Egypt and instigates the construction of the Great Pyramid. Avram and his mysterious friend Ubie must always evade demons unleashed by the relentless Absidian, always only a step behind. 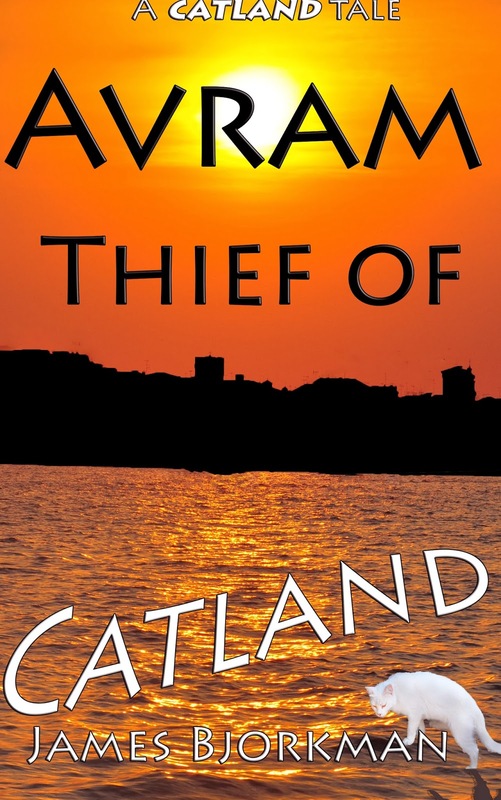 Avram: son of a simple man who turned the wrong way at an early age, and now is living to regret it. Absidian: the powerful queen of the City, a woman desperate for knowledge accidentally gained by Avram when he imbibed the potion and who will stop at nothing to capture him. Ubie: A devastated, lonely soul, Ubie is a young woman who suffered the cruelest of torments by Absidian. Now, she only wants to hide from the world and live out her endless days alone in the temple precinct of an abandoned desert city - until Avram stumbles into her life and changes everything. Minos: Absidian's henchman, a huge man with the brain of a child, always at the beck and call of Absidian but - perhaps - possessing an inherently gentle heart. Khufu: leader of an ancient civilization, thrust into that role by the assassination of his father Sneferu, Khufu is a towering figures of the ancient world and the key to Avram's adventure in Egypt. Merrer: A simple carver, Merrer meets Avram and unveils hidden talents that lead to the creation of the greatest historical mysteries of all time. Ranefer: Khufu's older brother, passed over for the throne and determined to avenge himself upon the royal family. Heppy: A lost soul, once a man but condemned by Absidian to life in a pit of death as a lizard, Heppy stands ready to aid Ubie in her hour of greatest need. Dino: Adrift at sea, lost and near death, Ubie looks over the side and spies Dino, a passing sea creature who may solve all her problems. "Avram, Thief of Catland" is historical science fiction based upon Egyptian mythology and still-unknown historical mysteries. A dark fantasy novel, this historical adventure hews closely to actual events that still mystify the world. Along with Avram's adventures in Egypt, accompany him on his adventures in romance with Ubie and their historical time travel romance. This page shows the progression of the cover creation for this upcoming novel. 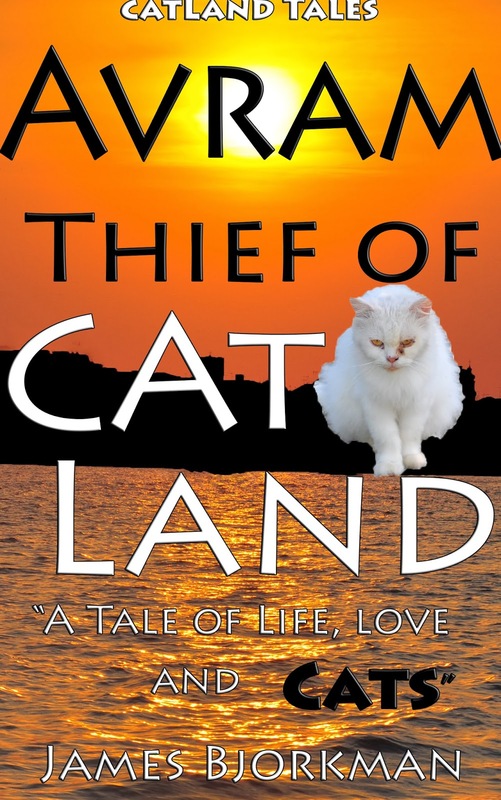 "A tale of life, love... and cats." Coming soon. I am working on the cover. If you have strong feelings about any of the covers above, please feel free to leave a comment. Atlantis: What Do We Really Know? Atlantis is one of those words that everybody, everywhere has heard or seen, and not just because it is a casino in the Bahamas or a recent Disney movie. If you asked someone where the United Nations was founded, or when the dinosaurs died out (both are trick questions, incidentally), you most likely would get a blank look or a wrong answer. Say the word "Atlantis," though, and you will see instant recognition in your interlocutor's face with an even quicker opinion. However, for such a well-known name, amazingly little is known about it. Plato was one in a series of Greek philosophers whose names also are commonly known. Socrates taught Plato, Plato taught Aristotle, and Aristotle taught Alexander the Great. Each man added something special to the river of knowledge that flowed from one to the next. Plato, who lived from roughly 423-347 B.C., was quite possibly the brightest of them all. Since these fellows laid the foundation of Western philosophy and science, that is saying quite a lot. Scholars were different in the old days: they didn't sit behind a desk or simply write, write, write. Instead, they went out and experienced the world. When he wasn't busy putting down his philosophy in the Socratic Dialogues, Plato found time to travel extensively. That was quite unusual in those days - it wasn't as if he could just go to the airport and catch a flight. Travel by sea was dangerous, there were pirates and storms and enemies and dangerous natural phenomena. Plato managed to wander around quite a bit. It is believed that he visited Italy, Sicily, Cyrene in North Africa, and Egypt. Not long before he died at a wedding feast, he spit out a couple of throwaway dialogues called "Timaeus and Critias. Plato used the Socratic Dialogue method to make his points. It is a marvelous rhetorical technique still taught to lawyers today, and involves asking questions in order to get desired responses and make an argument. In "Timaeus" and "Critias," Plato used four characters to make his arguments for him: Critias, Timaeus, Socrates and Hermocrates. We will never know for certain, but it is highly likely that Plato was purely putting his own words into these characters' mouths. Having different people express different sides of an argument made what otherwise would have been a dull academic disquisition into a back-and-forth that still holds the attention of readers 2400 years later. Plato assigned all the mentions of Atlantis to Critias. This character supposedly was a politician, though Critias knows an awful lot about history for the average ancient politician about something for which no known record survives. In response to a request from Socrates of an example of a "perfect society," Critias comes up with a description of the place called "Atlantis." Atlantis, according to Critias, was a huge island owned by the sea god, Poseidon. Atlantis was described as larger than Asia Minor and ancient Libya combined, which to the Ancients meant it was enormous. 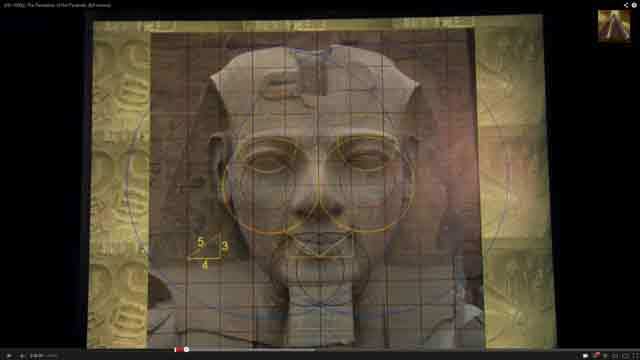 He said that the Egyptians knew about Atlantis, and they claimed it had mountains to the north and along the coast, with a great plain extending to the south. Poseidon's son, Atlas, inherited Atlantis and the ocean in which it lay, while Atlas' twin owned a little portion of it near the well-known Pillars of Hercules. Poseidon also had four other sets of twins, who also had small portions to call their own, meaning the island was divided into territories. Is this what Atlantis looked like? Poseidon lived on the island with his wife, Cleito. 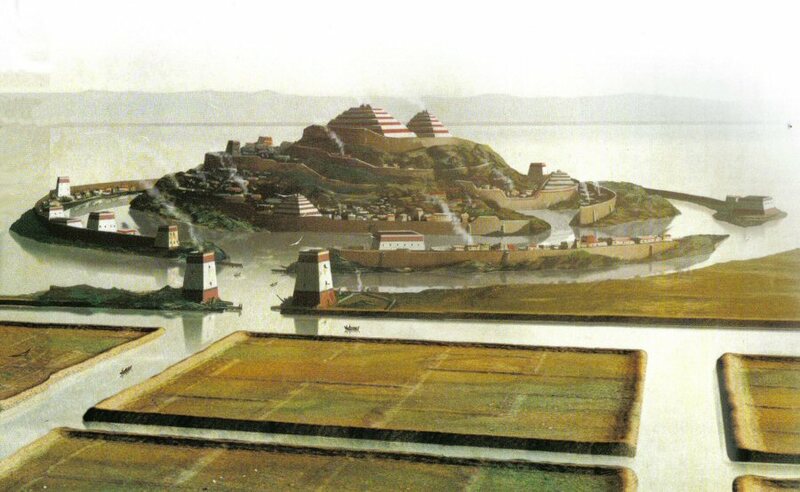 He built himself a grand palace and enclosed it within three circular sets of moats. There were bridges spanning the moats, and a canal to the sea, with canals also allowing ships passage along the road to Poseidon's palace. The city was an armed camp, with soldiers everywhere attending to gates and towers. That, believe it or not, is the entire known history of Atlantis. So, where did Plato get the idea for the island, or even the name? Well, surprisingly, there was a possible source for the name, in a pedantic work by someone named Hellanicus of Lesbos (Lesbos being a well-known Greek island). Hellanicus simply listed the descendants of Atlas, but he almost certainly was basing his work on earlier source that now is lost - which suggests that "Atlantis" was an accepted place name at that time. That last sentence is the crucial one. Crantor apparently had visited Egypt to check up on Plato's account, and, according to this fellow Proclus who was reading what Crantor wrote, Crantor found solid proof of Atlantis there. That an island of such nature and size once existed is evident from what is said by certain authors who investigated the things around the outer sea. For according to them, there were seven islands in that sea in their time, sacred to Persephone, and also three others of enormous size, one of which was sacred to Hades, another to Ammon, and another one between them to Poseidon, the extent of which was a thousand stadia [200 km]; and the inhabitants of it—they add—preserved the remembrance from their ancestors of the immeasurably large island of Atlantis which had really existed there and which for many ages had reigned over all islands in the Atlantic sea and which itself had like-wise been sacred to Poseidon. Now these things Marcellus has written in his Aethiopica"
As can be seen here, Proclus actually names the author of one of those books that we don't have, someone named Marcellus. "Aethiopica" is a reference to Africa, and if Marcellus discusses it in a book on Africa, that is a hint that Marcellus' sources showed Atlantis as lying in some relation to that continent - not Europe or the Americas. There may be some circumstantial corroboration for the existence of Atlantis from other sources, but it is very sketchy. The Roman writer Ammianus Marcellinus (is this the "Marcellus" of Proclus? ), also referencing a work now lost, mentions that the Druids of Gaul claimed partial ancestry from an unidentified island. The people of the Basque region of Spain, which seems a likely spot for refugees from an Atlantic island, are well known throughout history (including today) as having had their own language and culture, distinct from any other in Europe. When you see the recurrent headlines about "Basque separatists," you might just be learning of the current struggles of the descendants of the Atlanteans. There is all sorts of nonsense masquerading as science regarding Atlantis that was written for sensationalistic purposes over the past few hundred years. An American politician, Ignatius L. Donnelly, wrote an 1882 book about Atlantis called "Atlantis: The Antediluvian World" which was simply conjecture and hypothesis. Nothing wrong with that, nothing at all, but he had nothing more to go on beyond what we have today, namely, Plato and the others. 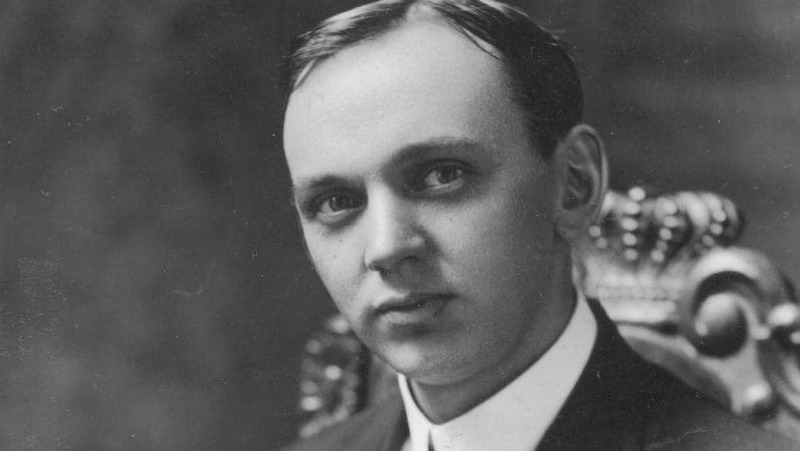 Edgar Cayce, a well-known and respected American psychic, made all sorts of comments about Atlantis which, wonderful healer and philosopher that he was, cannot be taken at face value. That doesn't mean that nothing new ever can be known about Atlantis. If Atlantis existed, there is evidence, and that evidence can be found. The only argument that suggests nothing new can ever be known about Atlantis is the one that goes like this: Plato was merely a rhetorician and philosopher, not a historian, and he made up his entire story of Atlantis. Scholars love to say that anyone who thinks that there ever was a place named "Atlantis" simply "misunderstands" Plato. There is all sorts of textual and interpretative rationale for this, but it is odd that Plato would give such precise coordinates for an imaginary place. It also negates the tantalizing reference to Atlantis by Hellanicus of Lesbos - which proves that the place was not completely made up by Plato. 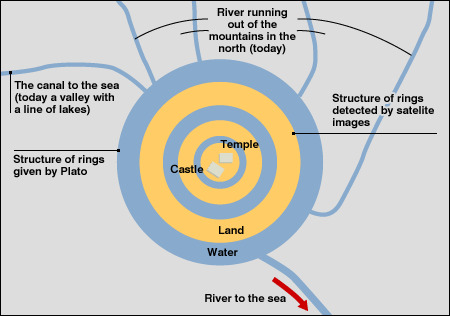 Still, the Atlantis deniers have a very valid position that can only be disproven by the actual discovery of an ancient place that resembles Plato's description. Fads about where Atlantis may lie come and go. Donnelly, the one who wrote "the book" about Atlantis, was positive it was in the middle of the Atlantic, but nobody really believes that any more (though there is no absolute proof to the contrary). A theory in vogue in the 1960s, which still retains some support by tourist guides, is that Atlantis lay on the ancient island of Thera (renamed Santorini in modern times). What is particularly convenient about the Thera theory is that the island mysteriously blew up during ancient times. Visitors to the island quickly become entranced by the black volcanic beaches, the white cliffside dwellings, and the excavations of ancient towns frozen in time by the lava that covered them during the island's demise. The main problem with the Thera theory, and unfortunately it is a big one, is that Thera was extremely well known to Plato and his cronies. It was not nearly as large as Plato described, and there is nothing particularly dramatic about Thera in any other ancient source (besides the fact that it blew up). If Thera had been Atlantis, Plato would not have babbled on about the Pillars of Hercules, which also were very well known then. Instead, he simply would have said, "Atlantis, which was on Thera, which blew up." He was trying to be scholarly, not mysterious. But he never mentioned Thera, and everything else in his dialogues (again, besides Thera's fate) is completely contrary to the idea that Thera was Atlantis. In 2011, there was exciting news: Atlantis had been discovered! An American Professor, Richard Freund, claimed to have found evidence for Atlantis in southwestern Andalusia, extremely close (practically nest to) the Pillars of Hercules mentioned by Plato. Apparently, there are marshlands in a park there which contain ruins which have some similarity to the circularity described by Plato. Since Plato also mentioned that the sea became muddy and impassable because of the demise of Atlantis, the location in a marsh was quite fortuitous. Dr. Freund theorized (or, according to his critics, speculated) that a tsunami (very much a current topic in 2011) probably wiped out Atlantis, leading to its refugees fleeing elsewhere in Europe and Africa. However learned Professor Freund may be, his conclusions are almost as reckless as Donnelly's were a hundred-odd years before. The Spanish are not bumpkins, and they have known about the site for a long time. They were not particularly delighted to have work they had been grinding through for years suddenly sensationalized by an American-come-lately. 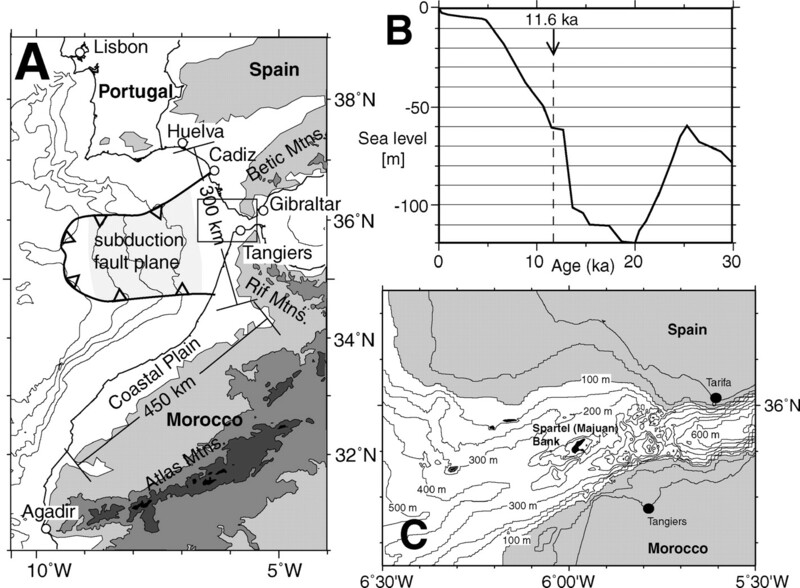 The southern Spain theory in fact had been put forward long before by others (Rainer W. Kuhne, Adolf Schulten), but no proof of Atlantis has been found there. The problem with Dr. Freund's theory, and again it is a big one, is that the area is crawling with researchers and scientists, and if there were ruins of Atlantis, somebody likely would have found them before, without any need to resort to speculation. But work there is ongoing, so further developments await. 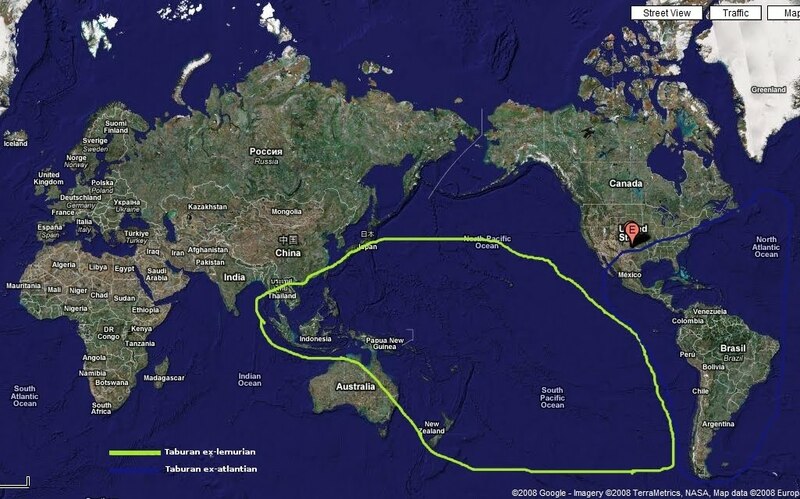 The obvious place for the location of Atlantis is somewhere in the Atlantic. Edgar Cayce said unequivocably that Atlantis lay there, with parts to be found by a specific date near Bermuda (unfortunately, the date came and went, and no Atlantis, though dates in this particular field are, shall we say, malleable). The beauty of the mid-Atlantic theory is that the Atlantic is huge, and there are many areas that have not been investigated. 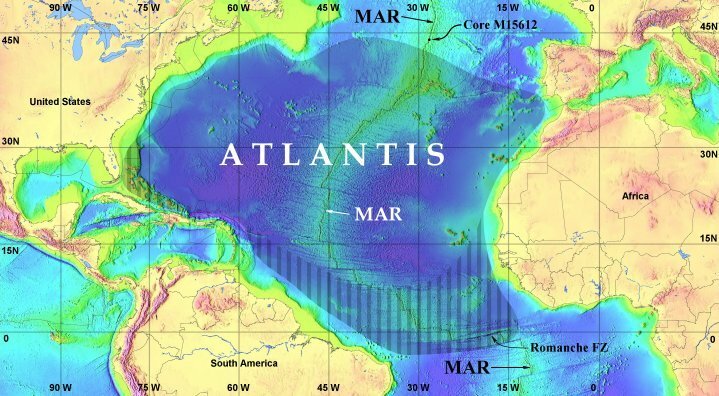 The presence of island such as Bermuda, the Canary Islands, the Bahamas, St. Helena and the like might identify the tops of the old Atlantean mountains. Once again, though, there is no proof, and with the intense interest in this question, every time an actual location in the Atlantic is suggested, "irrefutable" evidence immediately is adduced to rule that spot out. We are no closer to being able to say that the Atlantic hosted Atlantis than we were in Donnelly's day. One good thing about the Atlantis story is that it keeps researchers on their toes. As with the discovery of the Titanic, whoever produces tangible evidence of Atlantis will go down in history with the greats. Their name(s) in this case will be forever linked with Plato. For a scholar, there is no greater prize. It is difficult to think of a more sensational discovery than Atlantis, aside from, say, the Second Coming, a cure for cancer or a high-profile visit from intergalactic aliens. Kumari Kandam is the ancient name for a submerged continent in the Indian Ocean. Surviving ancient Tamil books describe Kumari Kandam as lying off the southern coast of India. No single writer came up with the story of Kumari Kandam: instead, it was an accepted fact among many writers of the period. 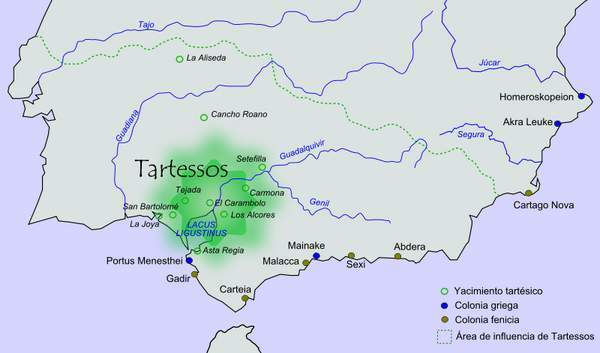 There is an extensive description of the place as being divided into numerous territories which is not necessarily inconsistent with Plato's account. The Indian Ocean is huge, and certainly could have housed a continent of the size described by Plato. There are many refinements about Kumari Kandam in the ancient Tamil literature, but the main points are these: it was huge; it was advanced; and it was divided into different regions. That all sounds suspiciously similar to what Plato had to say about Atlantis. The beauty of the Kumari Kandam theory is that actual proof from the scientific establishment recently has been supplied for its actual existence. Kumari Kandam is no longer just a myth or a "tale." Kumari Kandam existed, and it lay precisely where the ancient sources say it did, between the southern tip of India and Mauritius, the island nation off the east coast of Africa. 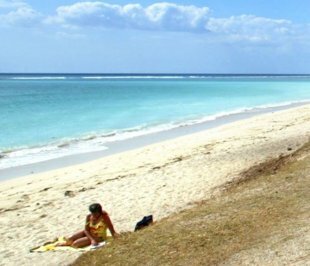 Proof of the type that hard-core scientists trust a lot better than some dusty old writings - sand grains on Mauritius - suggest to these scientists that this ancient continent fell into the sea, and then partially re-emerged. This is uncannily similar to some accounts (such as Edgar Cayce's) of Atlantis. These discoveries were just announced in February 2013, so nothing is settled. This description of the findings is not meant to imply that Kumari Kandam equals Atlantis, which is extremely doubtful. The immediate major problem with the theory is that Kumari Kandam is not precisely where Plato said it would be - but even cynics have to admit that Plato was vague enough to support a location practically anywhere beyond the Pillars of Hercules. 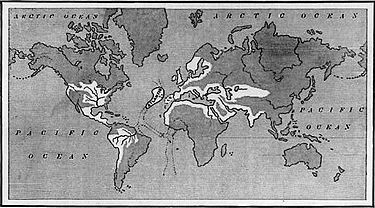 There is no evidence yet that anyone lived on this now-submerged continent, or that anyone could have due to how long ago it supposedly sank (though how did people know to write about the place if nobody ever lived there?). Think what you may about any relationship between Atlantis and Kumari Kandam, this startling discovery gives tantalizing support to people who choose to believe that we don't yet know everything about the world's oceans and what may lie beneath them - including, possibly, Atlantis.